When Robin Dubin, now a senior at Scripps College, first got wind of the art conservation program, she was planning on majoring in psychology. In fact, she had never even heard of art conservation. But once she did, she switched to the new program. “I love the thought of being able to work with objects, to preserve them for future generations, and to become a part of their histories,” says Dubin. She was smitten with “conservation’s unique interdisciplinary scope,” which allows her to bring together different areas of study she feels passionately about, integrating them in ways she had never thought possible. Scripps College has long been renowned for its strengths in the arts and humanities, as well as its interdisciplinary approach to education. So, with an increasing interest in the sciences among Scripps women, it was almost inevitable that these two fields, art and science, would merge into a new, interdisciplinary major — the only one of its kind at an undergraduate institution on the West Coast. Although in its infancy, Scripps’ art conservation major already offers students various courses taught by a conservation professional. Visiting lecturer Eric Doehne, until recently a conservation scientist at the J. Paul Getty Museum for 22 years, has taught three art conservation classes at Scripps. Doehne enjoys watching his students, a number of whom come from scientific backgrounds, apply their knowledge about microscopes and other laboratory tools to art. Doehne covers a wide range of current topics affecting the field of art conservation, including tourism, climate change, new technologies, and scientific advancements. 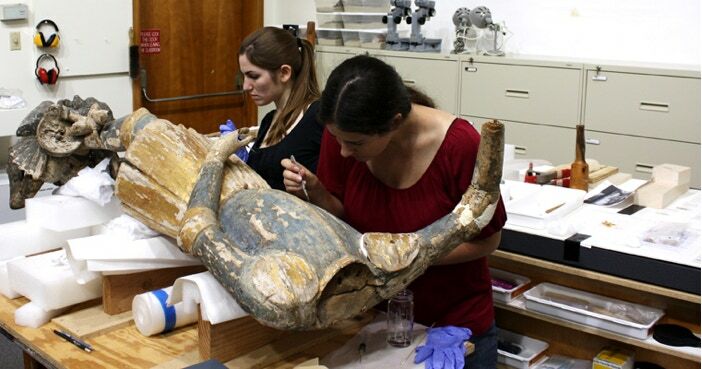 Indeed, art conservation is a good example of an interdisciplinary major at The Claremont Colleges. The major requires courses in art, art history, chemistry, anthropology, and archaeology, as well as actual art conservation courses. Because she discovered conservation near the end of her sophomore year, senior Dinah Parker feared she would not have enough time to fulfill so many requirements before graduation. However, with a closer look, she discovered that many of the courses she had already taken for a pre-med major counted and she can graduate on time. Parker notes the importance of getting “valuable hands-on experience” in art conservation outside of the classroom. Last semester, she had an internship at the prestigious Huntington Library in San Marino to learn about paper conservation. Mary Davis MacNaughton ’70, associate professor of art history and director of the Ruth Chandler Williamson Gallery, has secured internships at the Huntington for Parker, Dubin, and Jess Rosenthal ’13, despite the museum’s general policy to take only graduate students. Rosenthal is currently in the middle of her internship at the Huntington with a restorer who is repairing the Japanese Wisteria Arbor, a collection of sculpture trees from the 1920s made of reinforced concrete. Her work involves documenting the work’s progress, explaining the process to visitors, and some sculpting. Rosenthal’s main area of interest within the field has been archaeology conservation, and she plans to attend a graduate program in this area. In the nearer future, however, she plans to work at a field school in Israel this summer. Spring semester of 2011 welcomed the first art conservation course, an introduction to the variety of disciplines and approaches it encompasses. Last fall, Doehne taught two new courses; one focused on the study of matter and materials used in art conservation, and the other examined the relationship between global tourism and preservation technology. These courses are designed to work with the rest of the interdisciplinary requirements to best prepare students to pursue specific graduate work in their chosen area, and to go on to preserve artworks, architecture, and archaeology, both old and new, during this critical time in art conservation.